Availability: Ships Within 1 to 3 Business Days. Currently Unavailable. Named after the beautiful 164 foot Nojoqui Falls, 6 miles SW of Solvang, California. This series combines genuine multi-color Indian Rajah Slate with water flowing passed polished river rock creating a soothing sound and awesome focal point for any room. Now shipping with LED Lights!!! Choose and change colors to your mood from cool white plus 12 additional colors. Create effects such as gradual transition of colors, dim, brighten, and more all with remote control keypad. Rated for over 20,000 hours of lighting. 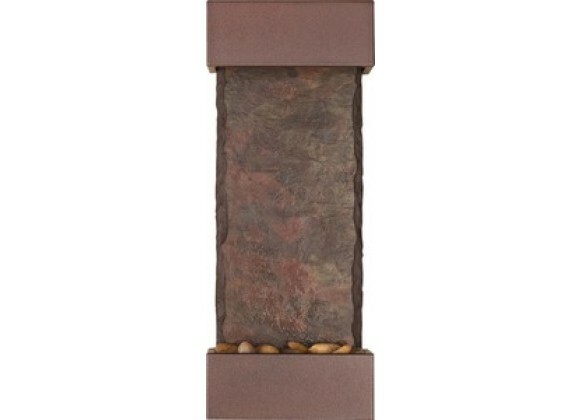 Engineered with Bluworld's splash-free design and featuring the new *NSI Slate, this water feature arrives to you completely assembled; simply hang on the wall per instructions and fill with water. NSI Slate- Our special process shears a layer of genuine Indian Raja Slate and fuses it to a composite material with the same chipped edge technique as slab slate. They are indistinguishable from a thick slab of slate. All the beauty is retained and the weight is reduced by over 90%. Please note that these units are handmade and measurements may vary slightly. Texture and color of the slate may also vary with each fountain.